Businesses face ongoing threats of disruption from external pressures they can’t control, such as technology, government, and culture. The extent to which companies can mitigate these risks depends on how closely they monitor these forces in order to inform a proactive approach towards them instead of a reactive one. How can businesses even begin to think about the Internet of Things? 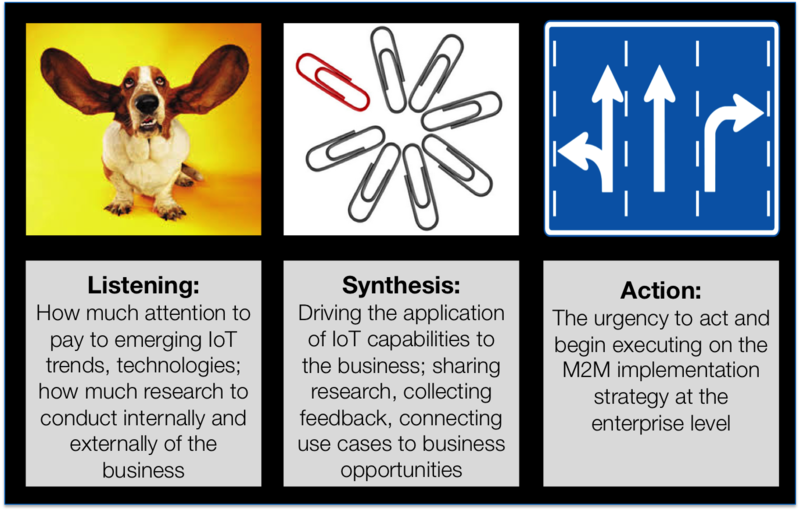 The following lays out one approach to assessing the business imperative for incorporating M2M into the organization. This is huge. And it could very well become the infrastructure for an entirely new paradigm of connectivity. Sound hyperbolic? Let’s roll this out. To begin to map this is to begin to map not only the types of devices involved in its ecosystem, but also to map the industries, locations, use cases, potential applications, and so on. 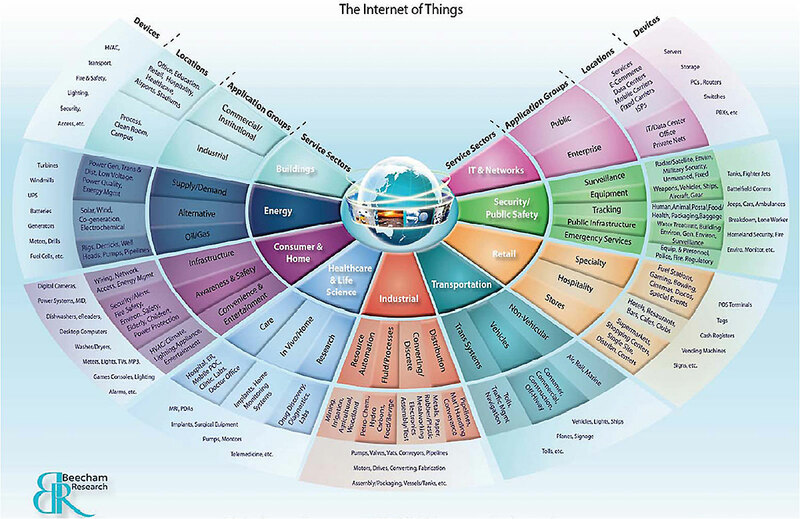 The most comprehensive mapping of the Internet of Things out there, IMHO, comes as a product of Beecham Research. I intend to make a dual point with this image: 1) that the Internet of Things transcends any one market, use case, or technology type and 2) it really is big, messy, and dynamic. And remember, it’s changing. Just as the infrastructure for the Internet itself as we know it, has evolved in structure, services, required components, and accessibility, so too will the Internet of Things. This evolution itself will shift how people define IoT. At a fundamental level, the Internet of Things is built on machine-to-machine interconnectivity, or 2+ devices talking to each other. This M2M dialog is the foundation of the Internet of Things; the industries, the applications, even the devices themselves, are backdrop. How can businesses know where to begin? Work backwards. Work backwards from the following use cases to assess 1) Relevance: Do any of these align with our current business pains or opportunities? 2) Feasibility: Is this actually feasible? Traditionally companies view electronic and electromechanical products as stand-alone products, which are not generally connected to each other. Yet, ‘getting this’—read: understanding the unique risks and opportunities IoT creates for your company— requires this construct to be broken. It is the networking/connectivity of seemingly un-connectable components, and the management of these interactions that will deliver the intelligence (i.e. ‘smart services’) IoT enables. 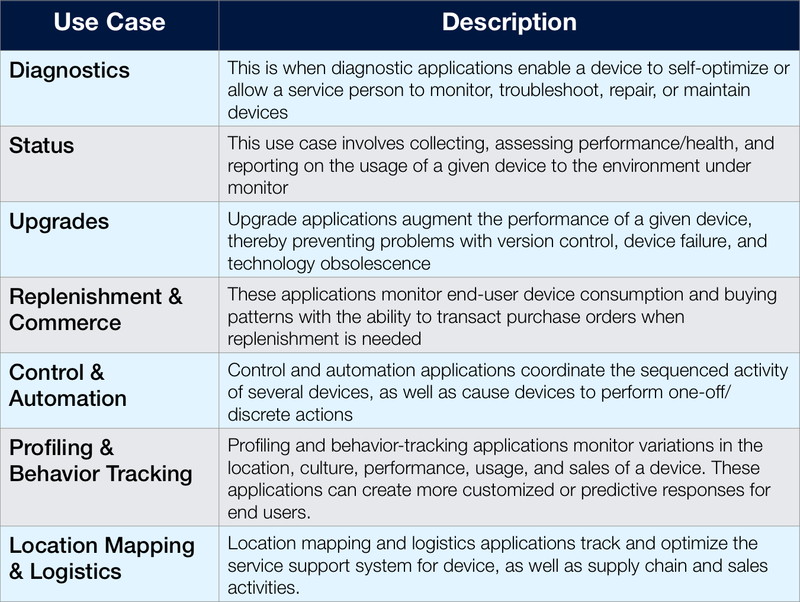 The point here to assess which of the above use cases could be applied to your business [model]; which use case(s) for connecting devices carry the greatest impact. Think in threes; think about what’s already in-place, think what should be, and think what could be. Already in-place/in use at my company? What do we use to do this today? Critical or very important to the delivery or function of our product or customer experience? Not in use or in the budget today but, if implemented, could transform day-to-day operations and efficiency for what we do? Once you have assessed where your business lies in terms of priority to implement (i.e. leverage connected devices to serve related use cases in your company), you will understand at a fundamental level just how much to care. How you rate priority will dictate the imperative for how closely you listen, synthesize, and act. The resources required for each of these will vary based on priority. A high priority assessment, for example, will require more resources– from people to technology to time– dedicated to build a strategy and begin execution. The following are recommendations to help you get started with an action plan informed by the level of relevance the above use cases have on business today. 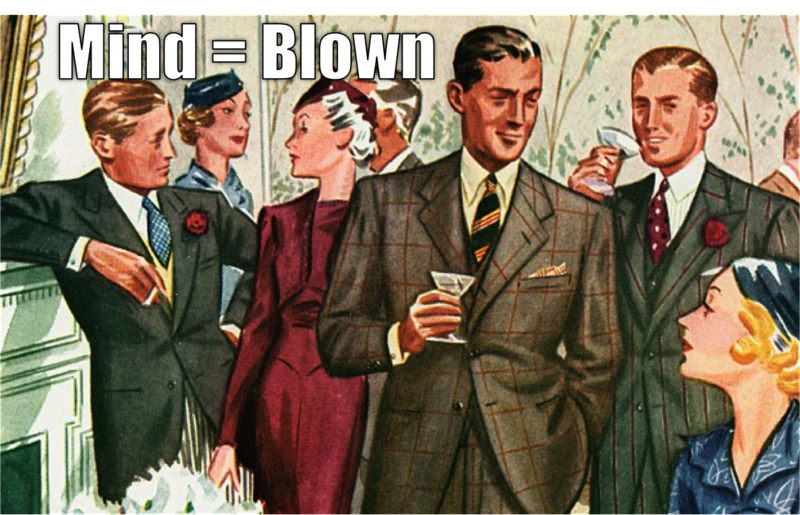 Continue having your mind blown over IoT banter at cocktail parties! 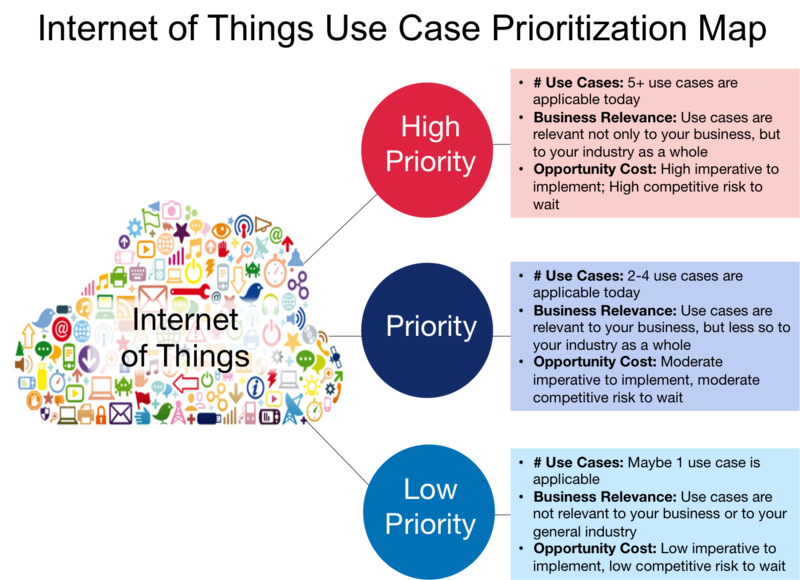 When beginning to think the value of Internet of Things to the business, and especially when assessing the priority of implementing an M2M strategy against certain use cases, remember feasibility. Start with the low-hanging fruit. Pilot a proof of concept with a relatively easy integration and adoption curve. Innovation must prove value to fuel more innovation. This market is relatively nascent, but it is growing quickly. Businesses who overlook this boom risk being outsmarted by their competitors or even face full disruption from entirely new markets this technology will create. The earlier businesses can begin thinking about the impact of the Internet of Things on the business in an informed, mindful, and practical way, the more likely they will be to harness its potential.